Oh, how much hate this poor obstacle received (in female circles, specifically). I have not seen so much wrath since… Actually, I have not seen so much wrath regarding a specific obstacle. Period. Gender discrimination was brought up. Inequality. Fighting for our rights. Constitution. Someone may have quoted Martin Luther King. For those not familiar, the sternum checker is an obstacle that consists of two thick logs (four, if you count the base). The difficult parts of the obstacle are twofold: 1) the upper log is actually quite high up, and 2) there is a significant distance between the base log and the upper log, making simply reaching for it impossible. 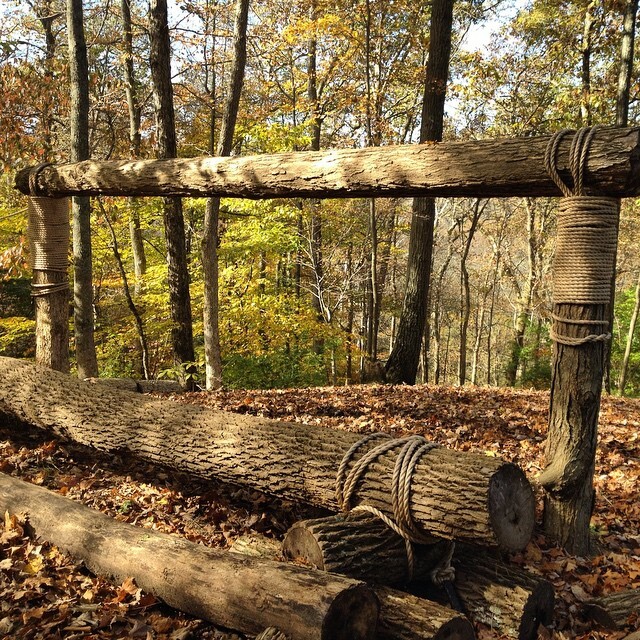 This is one of the permanent obstacles on the Mud, Guts and Glory course since August 2013, and has been used in Mud, Guts, and Glory events, as well as BattleFrog events and OCRWC 2014. The major argument made against this obstacle was that it discriminates against women. A serious accusation against a piece of wood, no? The reasoning goes like this: the sternum checker is obviously easier for taller individuals, and harder for shorter individuals. Men, on average, are taller than women. Hence, this obstacle is harder for women. Injustice! An average American male is 5’10, while an average American female is 5’5. So yes, men have a significant height advantage. But, unless this disadvantage is somehow female specific, we cannot claim gender discrimination. In this case, the sternum checker would also be easier for taller women (compared to shorter women), and harder for shorter men (compared to taller men). Some mentioned that having breasts puts one at a disadvantage, as it can be painful to slam the breasts into the log. That indeed would be a more female-specific variable, however I will dismiss that argument entirely for two reasons. 1. Height plays much more of a role in one’ ability to tackle this obstacle than breasts. 2. Size of breasts would have to be taken into account, because, arguably, smaller breasts would be less problematic in this case. And then, if we take into account breast size, we might as well take into account femur length, the relative length of torso to legs, and million other things that are only marginally relevant to the discussion at hand. Also, do not forget that male racers have their own unique disadvantage. Two words: testicles + walls. Careful, gentlemen. Careful! Gender is then an extraneous variable that just happens to correlate with the actual variable of interest – height. Which brings us to the possibility of height discrimination. Height discrimination refers to discriminatory treatment against individuals based on their height. Examples would include treating individuals based on their membership in a certain group and restricting individuals from opportunities that are available to another group. Excluding individuals based on height (or some other characteristics) is not necessarily a bad thing. Do I go to Laura Petites (women’s clothing store) and complain that nothing fits me? Probably not. Athletics presents another interesting consideration, as certain amount of height (and other types of) discrimination is built into the very nature of sports. It is easier to shoot a basket if you are taller. And anyone, who claims otherwise, has never played basketball.It is then hardly a surprise that the average height in NBA is 6’7 (compare that to an average male at 5’10). Yet, we are not arguing that the basket should be lowered, every time a shorter player is about to take a shot. 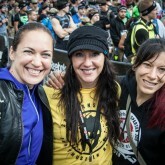 In obstacle racing, the walls are, of course, easier if you are taller. Because the arm-span is proportional to one’s height, taller racers probably benefit on the rig and the monkey bars. 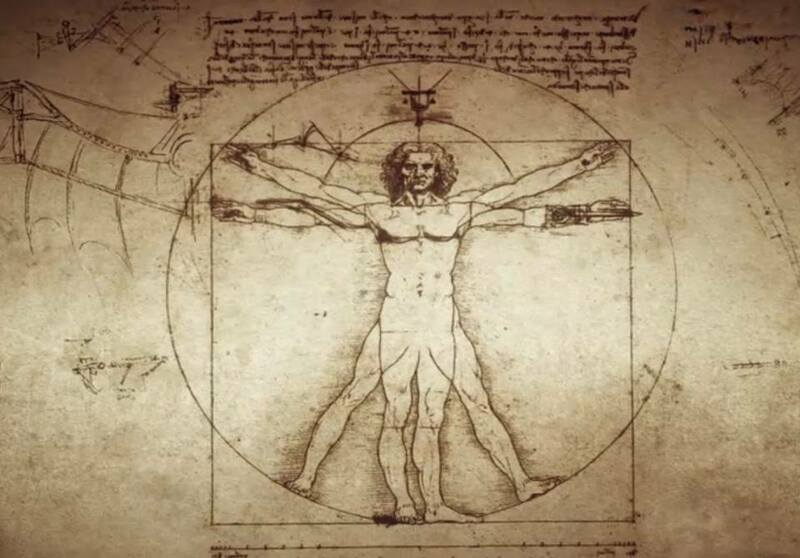 According to da Vinci, “if we measure the distance from the soles of the feet to the top of the head, and then apply that measure to the outstretched arms, the breadth will be found to be the same as the height” [Source]. In other words, a typical ratio of an individual’s arm span relative to their height is (close to) 1. In some sports (like climbing or swimming), a ratio greater than one (so, the arm span is greater than the height), can provide the athlete with some competitive advantage. For example, Michael Phelps’ arm span is 12cm greater than his height. Is he at an unfair advantage? Abso-freaking-lutely. Barbed wire crawls and tunnel crawls are more difficult, as tall folks are forced to crawl on their knees, while shorter racers can bear crawl their way through. Because the rigs are set up at a certain height, tall racers can struggle to keep their feet off the ground, while traversing the obstacle. The second rig at OCRWC 2015 was significantly lower than average, hence benefitting shorter racers. 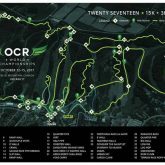 Taller racers at OCRWC 2015 were partially submerged in water during the low portion of the monkey bars, having to deal with the additional resistance of water, as they transitioned to the ascending portion of the obstacle. So, back to the Sternum Checker. Is that obstacle “unfair” to short racers? The height is definitely a factor, however, it is not the factor that makes the obstacle impossible. Yet, if you ARE short, AND can’t do the sternum checker, then height is an easy variable to complain about, as that’s something entirely out of your control. Because someone will invariably bring up MY height, let me get this out of the way. I am almost 5’9. But I am not talking about MY experience here. I have so far heard from women who were 5’4, 5’3, 5’2 and 5’1, who were all able to complete the Sternum Checker. With this obstacle, if you have a height advantage, technique actually does not matter. You (long-limbed gazelle, you) have enough length to simply do a little hop, and off you go. If you are shorter, you HAVE TO rely on technique more. Let’s consider the factors that go into conquering this obstacle for shorter racers. There are FOUR. Because the log you are aiming for is so much higher than the base log, you will need to propel yourself upwards. The name “sternum checker” is actually misleading, and screws up the racers who are not familiar with this obstacle. You think you should land on the log with your sternum. In actuality, if that’s how you land, you are way too low – so you will have trouble holding on, and reaching around. There is practically no way to salvage yourself at that point. Let go and try again. That’s what happened to me on the first attempt, and after hanging onto the log for a little while, I fell to the ground like a sack of potatoes. With some coaching from a fellow racer, I realized that you have to land on the log much lower – with your belly button, or even better, your hips. Some racers blamed the lack of grip strength. In truth, if you land high enough, you do not need your grip at all – you’ll simply be pushing into the log with your hands to get your legs up. Because of the distance between the two logs, you will need the momentum to generate enough horizontal displacement. Check out the video below (over an hour of footage at the Sternum Checker) – I have included direct link to the point in the video about four minutes in, where you see couple of racers struggle. Invariably, these are the racers that hesitate once they reach the bottom log. If that happens to you, get off the log and restart. You NEED that speed and momentum. Otherwise, you’d be as successful as you’d be trying to leisurely walk up a quarter pipe. Remember Everest from Tough Mudder? Yes, the sternum checker is much more of a mental obstacle than people realize, especially so, for shorter racers. It’s literally a “leap of faith”. I have seen and heard from many racers who are of average height, and should have no problems completing this obstacle, who struggled, because they simply could not bring themselves to leap. And yes, there IS a height that would render this obstacle impossible (I’d estimate that height to be under 5 feet). Yet, the above three factors address about 95% of the height distribution. YOUR TURN: Is there an obstacle that you are disadvantaged at because of your height, weight, body structure? What is it? What are you doing to compensate? Liked this post? Check out my essay on what a real burpee look like.